This book came in the mail today. I was so excited, I took the book and read it right away. It was just as good as the first two, maybe better. I love that these books explore things that are unusual in books for girls that age, such as science and space, but also have morals that many people can relate to, such as friendship, working together, and thinking before you act. 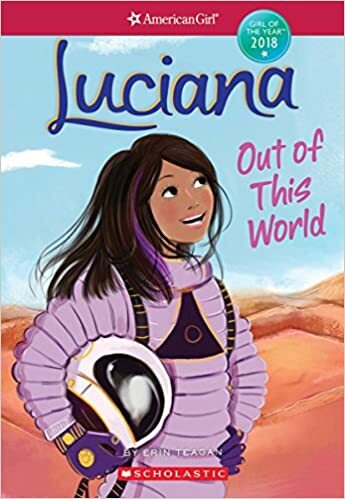 I didn’t realize there was going to be a third Luciana book, let alone that it was out yet. I hadn’t heard anything about it, but when my mom asked if I wanted any books from Scholastic it was listed on the page, so we bought it. It’s not available on the American Girl website yet, but you can get it from Scholastic, Amazon, and probably a few other places. I’ll review the other two books eventually, I LOVED them both, but I wanted to share with you this amazing book. The book starts with Luciana going to visit her family in Chile for winter break. She is so excited to visit her four cousins the same age as her, but when she gets there they don’t seem excited for her to be there. They are all good friends, and Luciana thinks that they don’t need or want her as part of “Los Cuatro” the four. Claire, a girl from the training camp Luciana went to last summer, not a girl that Luci is really friends with, is also in Chile. Her scientist dad is doing studies in the dessert, and had to drag Claire along because there was no one to take care of her. So Claire invites Luciana to come with her to the dessert. It would be a great opportunity for Luci, she would get to meet real space scientists, sleep in a Mars habitat, and maybe even do some tests of her own! But Luciana doesn’t really trust Claire, after some events that happened last summer. Some really scary, life threatening events. Luci still has nightmares about these things, is scared of things because of what happened. Besides, she believes her mission is here with her cousins, to just be with her family. Luci turns down the invitation without even asking. But when things between her and her cousins get worse, and she doesn’t feel connected at all, she feels bad that she turned the opportunity down. It would be an amazing experience, and maybe she would have more fun with Claire then with her cousins. So she talks to her parents, and they are skeptical of Claire, after what she did last summer. They are also worried about the aftershocks of an earthquake, An earthquake in that makes her grandparents’ house unstable, unsafe to live in. But Luci convinces her parents that Claire has changed, and that no aftershock will come. And her parents let her go. Claire is nice to Luciana the whole way to the dessert, and Luci believes that Claire really has changed. But when Claire’s dad has to go to a meeting instead of taking the girls to see the geysers Claire turns into the same girl Luci knew before. Luciana talks Claire into going with the other scientists to take samples of the dirt, but Claire won’t talk to her the whole way there or back, a total of four hours. And when Luci accidentally ruins all the samples and the scientists have to go back Luci is left alone with Claire. They are in bed when disaster comes. Claire helps Luciana, but then runs off into the dessert when Luci needs her most. Luci begs Claire not to leave, afraid she has abandoned her again, but Claire comes back and saves the day. They forgive each other, and Luci learns to listen more. Things between Claire and her dad also work out. When Luciana gets back to her family, she works things out with her cousins as well, listening instead of doing all the talking, and they accept her into “Los Cuatro” making it “Los Cinco”. Things don’t work out in favor of her Grandparents’ house, but they decide to hold onto the memories. Overall, I loved the book. I liked how it carried on the science/space theme, while also having a theme of listening and forgiving. I rate this book 5/5 stars. Even though the grade level is a few years younger then mine, I thoroughly enjoyed the book. I recommend this book. It would be great for 9-13 but also for any age reader. When I read the Luciana books, I started making lists of things I wanted to make from the books. Robots, penguins, all sorts of things. Normally in American Girl books, I want the character to not get what they want, because it’s so cliche. But in Luciana Braves The Deep I wanted Luciana to go the Cetus, the underwater habitat so I could see inside it. Spoiler alert, she does get to go to Cetus. And when I read that part I knew I wanted to make an underwater habitat for my dolls. I wanted to do more that just a cardboard room this time, though I didn’t want it to be completely permanent, because I knew it would have to be big. I was thinking building a wood box to put it in. Then I remembered a contest that my Mom had entered me and my sisters in. (Without asking, but she knew we would want to do it.) A recycling challenge, called the Build It Challenge. So I decided to make my underwater habitat for the challenge. The Build It Challenge doesn’t have many rules, but among the few lies “No power tools.” So that rules out building a wood box. I’ve wanted a bookshelf under my window for a long time now, and also a window seat. So I decided on trying to find a bookshelf at the thrift store, with a shelf under the room for books, and the top the window seat part. It seemed like a perfect way to have everything I wanted there. The first time we looked at the thrift store we didn’t find anything. The second time we looked we found these two bookshelves, only one with actual shelves, and not in great shape, but they were only a dollar each, so I convinced my mom to let me take them home. I started by pulling the shelves out, and the little thingies that keep the shelves up. To be wide enough for a bed, they had to be both there, so I shoved them together. They are made of particle board, but the backs are only thick cardboard. One of the shelves’s back was falling off, so I yanked it all the way off with the back of a hammer. They don’t have the shelf underneath, are falling apart, and, as of right now, aren’t sturdy enough to sit on. But, although they aren’t perfect, they are good enough, and I know I can make them work, I know I can turn them into an amazing underwater habitat. I have about a month before the challenge, which is a lot of time, but not for what I’m planning to do. I’ve started on the beds and some other stuff, but I have a lot to do. I’m planning on posting updates regularly, so stay tuned for the next part! Yesterday (After I spent most of the morning cleaning my room, of course) I dressed all of my dolls in Christmassy (Or wintery, I only have so many red doll pieces.) attire. I was going to post about it last night, but didn’t get a chance. So first of all I undressed all the dolls thinking random thoughts like “I thought this was Abby, why am I doing Joy?” “How did I get so many dolls?” “Where is Mckenna? And Hope, and Faith, and…Oh, I forgot to get that shelf of dolls.” Etc. Then I put the clothes away. Then I picked out sixteen Christmassy or winter outfits. (Actually I counted first. How did I get so many dolls?) Then I laid them out and dressed one doll at a time, picking an outfit for the doll as I dressed it. And now here they are. As you can see, not all of the dolls are in red or green. I only have so many pieces of red and green doll clothing. Now here are pictures of each doll next to my mini Christmas tree. It’s blue, so not all of the outfits match, but whatever. The dolls are in no specific order, just the order the computer chose. This is Olivia. She is a doll I randomly got at the thrift store one day. I had a bunch of dolls I was going to give away, but that might not happen. Her dress came on an also thrift store doll, but it’s perfect for Christmas. Mia’s outfit is kind of random, and I’m not sure I like it, but it’s okay. She’s wearing a tree skirt from the dollar store I bought a few years ago. It looked bad the first year, (It kept falling down, and there are probably pictures you could find of Mckenna in her underwear,) but I finally got it to stay, and it doesn’t look bad now. Mckenna refused to wear a skirt, or really anything nice, but she agreed to wear the green shrug. She wouldn’t change into matching shoes, insisting that it was Christmas and she should be allowed to wear comfortable shoes. Ooh, I love this picture. Nothing about Lea is Christmassy, but she looks nice. The dress Kaitlyn is wearing I made a long time ago. I don’t like it as much as I used to, but the fabric is perfect for Christmas. Joy isn’t looking at the camera, but I love this one all the same. She kind of looks like a dancer, which she’s not, she’s a writer, but it looks nice all the same. Ha! I knew this dress would be useful for something someday. Jenny doesn’t care if she looks old fashioned. I love this one. Grace is all blue. Even her earrings are blue, though you can’t see them. And her shoes match the hat, which sparkles everywhere, and the sweater. Callie! I love Callie. For Christmas, my little cousin received a doll from our Grandparents. Callie. My Grandma had asked advice from me on which one to get, and I told her that as far as off brand dolls go, I love the Journey Girls. So now my cousin has Callie too! Kierra wanted to be in a picture with her sister. Her outfit doesn’t match at all, but she insisted on wearing the leggings so she “wouldn’t be cold.” I don’t know why she can’t wear shoes, but no shoes for Kierra. I finally have given up on Faith being older than the rest. She doesn’t look like it, and none of my doll clothes make her look older. And now Abby. Normally I don’t like Abby’s outfits or pictures very much, but I like this one a lot. So there are my dolls in their Christmas outfits this year. I hope you enjoyed. This was such an amazing book. Best American Girl book I’ve read. I loved it so much. It was so relatable to normal girls. I related to it quite a bit, though I am way older than the target age range. I requested this book through our library system, but I didn’t read it right away when I got it. To be honest I wasn’t all that excited about it. But I finally started it. It was a little slow to get into, but it was so, so, good. The story is about Gabriela dealing with several different things. Her ballet class is working on pointe shoes, something Gabi has dreamed about for most of her eleven years, she is helping plan a halloween party with her co ambassadors, and making a costume with the group. She is making a costume with her best friend Teagan, and working on multiple poems for the upcoming poetry slam she is doing with Teagan, and some other friends. With all that is going on, some things get pushed aside, especially her friendship with Teagan as she becomes better friends with her co ambassador and former enemy Aliyah. In the end Gabriela must make a choice about which things mean the most to her, and which ones are only weighing her down. But, to me, the book is about friendship, being overwhelmed with too much stuff, and being a good friend even when it’s hard. I loved how there were lines from Gabriela’s poems in the book, and how one of the poems changes as Gabi grows and changes. I liked the message that friends are as important as dreams. But mostly, I loved the decision Gabi had to make, and how it only made things better, though it was really hard. Go read this book. It’s seriously amazing. Kaylen’s World Is Having A Giveaway! Kaylen’s world is having a giveaway for a bunch of cool doll stuff. You should go check it out! Madi is having a giveaway for a FREE create your own American Girl Doll. I would go enter if I were you. It ends on the 30, so hurry. Why are you still here? Go enter!